In overall we spent US $70.7 K in period of September 08 – 09, versus US $61.5 K in period of August 07-08. Which is US $9.2 K difference. - - We hadn’t been on vacation first year, so entertainment budget increase by US $7.4 K – two weeks on Virgin islands and two weeks sightseeing canyons and national parks in Utah, Arizona, California. - - Both of us had to do root canal, which added additional US $2.7 K.
The rest of the notes a fairly general, highlighting re-balancing in expenditure. Miscellaneous up US $2,5 K difference due to flight to Moscow for new posting arrangement, digital camera for wife's birthday. Kindergarten – same fees are actually stayed the same, but over expenditure in 2009 is higher, so weight is lower. Do not been fooled by percentage weight only, look for the values as well. Food – down US $1.5 K. Because we were on vacation for nearly a month in 08-09 we spent less 1,5 K, but we ate less as well, somehow. 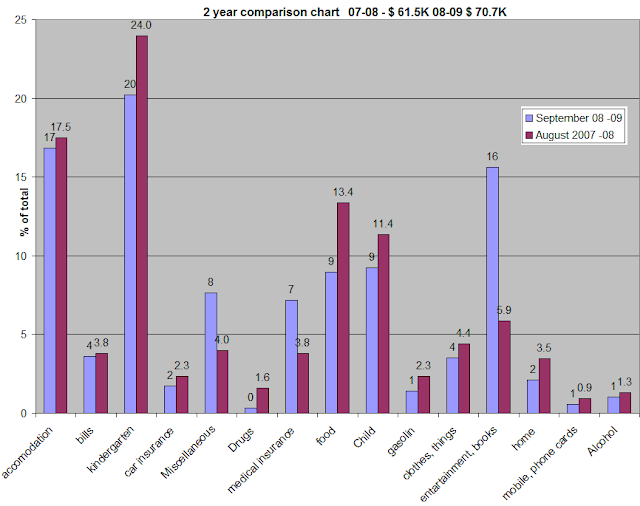 Child – down US $0.5 K. Despite child grown older expenditure is stayed the same, we spent slight less on food, as it fed in the kindergarten, primarily. Gas - down US $0.5 K. Spent 500 USD less on gas. Vacations and lower prices. Home – up US $0.5 K.
For year October 08 – 09 we decide to fix travel budget as 10% of after tax income and fix savings/mortgage deduction. Which at the moment looks like US $800 a month. In overall we spent on bills, renting accommodation, kindergarten and food for us and the child & gas – 60% of overall budget or US $42 K in 08-09, in 07-08 this figure was 72% or US $44 K. Which confirm the suggestions above. 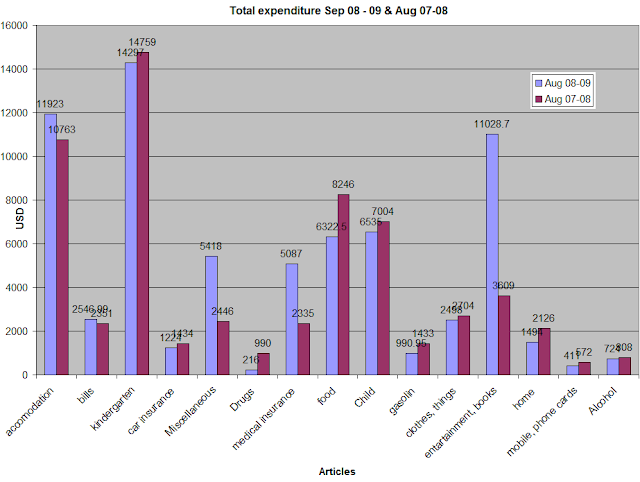 Our essential expenditure stayed the same but we indulged ourselves with traveling and health services. Plan for 09-10 to maintain income and keep level of expenditure at the same level - US $71 K. I could not exclude dentist, as we are getting older and this is inevitable increase our health maintenance cost.